This week, Chicago took another step in affirming its commitment to eliminate traffic fatalities and serious injuries on our streets. Mayor Emanuel announced the city will release a three-year Vision Zero Action Plan in fall 2016 that will reduce crashes for everyone who uses the streets. The plan will set forth the goal of eliminating traffic fatalities and serious injuries by 2026. Vision Zero is an international traffic safety movement guided by the principle that no loss of life on our streets is acceptable. Traffic crashes are not mere “accidents,” but preventable incidents that can be reduced and eliminated with systemic changes. One of the advantages of the Vision Zero approach to traffic safety is that it requires the collaboration of all city agencies working on our streets, not just the department of transportation. Ten city agencies are now participating in Chicago’s initiative, including the department of public health, the police department and the department of fleet and facility management. We have been calling for the city to develop an action plan involving multiple agencies for several years — since Chicago first committed to Vision Zero in 2012. Earlier this year Chicago showed it was on this path by joining the national Vision Zero Network and sharing best practices with other U.S. cities working to eliminate traffic fatalities. The commitment has drawn increased attention this summer because four people biking were tragically killed on our streets. 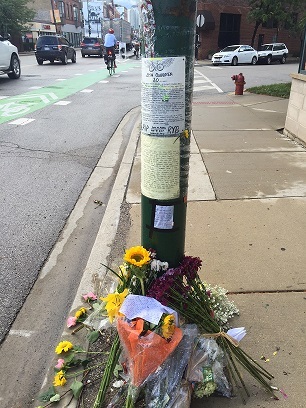 In speaking about this summer’s fatalities at Wednesday’s Mayor’s Bicycle Advisory Council meeting, Chicago Department of Transportation (CDOT) Commissioner Rebekah Scheinfeld said she hopes the plan will help the city implement more strategies to prevent these tragedies. For years, organizations like Ride of Silence have helped educate city leaders and the broader public about the incredible human suffering caused by preventable traffic crashes involving people biking. Last year, 46 people walking were killed in Chicago. About 80 percent of the traffic fatalities and injuries in Metro Chicago are people in cars, and only a small percentage of those incidents happen on highways. That means the battle for Vision Zero will largely be won on local streets. The city’s action plan will create opportunities for us to work together to achieve real progress. Active Trans is participating in stakeholder meetings around plan development, and later this fall, the city will host public meetings to collect feedback and input. We are hopeful this process will allow the city to dig deep on issues that continue to plague street safety locally, like too many super-sized streets that invite motorists to speed and the alarming number of serious crashes involving large vehicles driven by professional drivers. We look forward to working with our supporters and city leaders to identify, fund and implement proven crash reduction strategies. The only acceptable number is zero.